Science Museum to exhibit UK's largest horn speaker | What Hi-Fi? London's Science Museum is set to show off the UK's largest horn loudspeaker as part of a new exhibition – The Exponential Horn: In Search of Perfect Sound. The speaker, known as the Denman Horn, is 27ft long with a 7ft 1in square horn mouth, and was originally commissioned in 1929 by Roderick Denman, the then curator of telecommunications at the Science Museum. 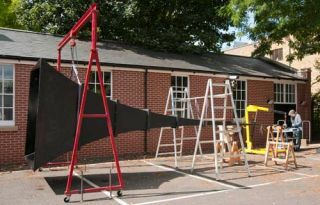 The new version of the horn has been rebuilt over a period of eight months by the Science Museum's Workshops, and features a 9ft section of the original speaker. The giant horn speaker was originally built to establish a benchmark in audio quality, constructed to dimensions scientifically determined to deliver the widest possible sound frequency range. The horn forms part of an exhibition curated by former Science Museum sound artist-in-residence, Aleksander Kolkowski, which will feature events and audio demonstrations including live broadcasts, sound art and archive radio footage. BBC History, BBC Radio 3, Resonance 104.4FM and the Royal College of Music are just some of the contributors involved. The Denman Horn will fill the Virgin Media Studio, Media Space at the Science Museum, and promises "to astonish with the depth and clarity of its sound". Aleksander Kolkowski commented: "This audio leviathan, seemingly primed and ready to blast through the museum walls, instead offers up a uniquely immersive aural experience, one in which sounds and voices from the past and present converge." John Liffen, Curator of Communications, added: "The wonderful original horn was lost in an accident back in 1949 so its re-creation is, for me, the fulfilment of a long-held wish." The Exponential Horn: In Search of Perfect Sound will run from 20th May in the Virgin Media Studio, Media Space, Science Museum, London, alongside the Oramics exhibition on Daphne Oram and the history of electronic music. Full details of the installation and its events programme can be found on the Science Museum website.